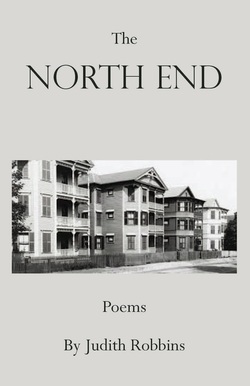 The North End is Judith Robbins’ first collection of poems. It is a tribute to the life experiences of people in a neighborhood of the working-class poor in post-World War II Worcester, Massachusetts. From three-decker, cold-water apartments and broken streets, the writer has gathered poems that call attention to that hardscrabble place and to the humanity of those who lived there. The poems from the second half of the collection reflect the writer’s migration North to Maine. She offers the reader poems of the sea, the woods, and relationships, in a cold climate where warmth is at a premium. Judith Robbins’ The North End, is an honest look back at the characters, incidents and landscapes of a childhood “war zone lost in time,” and a series of reflections on the serenity and turbulences of life lived much later in Maine. Simultaneously startling, insightful, painful and determined, the poems in this collection explore the relationships of language to memory, of lifelong hurt to resolve, and of love in its dizzying array of guises from place to person. The straightforwardness in these poems is refreshing, and the range of emotion expansive. —DANA WILDE, author of the Off Radar reviews column for the Kennebec Journal and Morning Sentinel newspapers. Poet Judith Robbins has taken the stones of her first house, in the gritty, frost-bitten North End neighborhood where she grew up, and built a second house – a life devoted to writing - where she has flourished. The girl who watched and felt deeply what she saw became the woman who reconstructs in story-poems and portraits the hazards of that childhood: the boy who killed cats, the girl whose mouth was disfigured by a dog bite, the boy who fell to his death from a second story window, the mother with knuckles raw from hanging clothes outside in winter. In “My Retinue,” “Dependence,” “Repentance” and “Tony’s Candy Store” we too feel the shame and disappointments of life lived early on the edge, but we also taste the sweetness and hope, and see what can be saved. With emphatic honesty mingled with strength and compassion, Robbins honors that harshness, showing us too the loving family that nurtured her, and a transforming faith that has guided her steps. There is great heart here. Judith Robbins’ poems are vivid, funny, sometimes shocking, always moving. Reading these poems, you find yourself in hardscrabble working class Worcester of the post-war era, the dark places between the tripledeckers; or you’re plopped down into the unpredictable weather of inland Maine. Wherever the poems take you, the light gets in. Family, place, heritage, language: these poems bring all those things together in moments and memories that again and again give us glimpses of haven (and heaven). Judith Robbins is the mother of four and a graduate of Bates College and Harvard Divinity School. She grew up on Milton Street in the North End of Worcester, MA, in an area called Poets Hill, the neighborhood she celebrates in this, her first collection. She moved to Maine in 1967 with her husband Jon, where she still lives and writes. Her first poem was published when she was seven, and she has since been widely published in magazines and journals, including The Worcester Review, Puckerbrush Review, and The American Scholar.